Sun and clouds mixed. High 76F. Winds S at 10 to 20 mph..
OSHKOSH — Two passions fuel Jimmy Graham, each related in one way or another with moving quickly through the air. Football in the fall, flying in the offseason. A 1950s-era amphibious plane that he restored to pristine condition also represents how far he has come back from a serious knee injury. Both rebuilds occurred a few years ago while he was playing for the Seattle Seahawks. 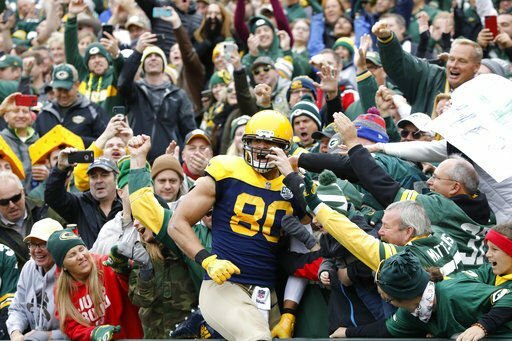 This season, the aviation enthusiast and pass-catching tight end has landed in Wisconsin for the next leg of his NFL career with the Green Bay Packers. "They ebb and flow together. It's the two biggest parts of my life," Graham said about flying and football. "I don't think I could be as good at one without the other." 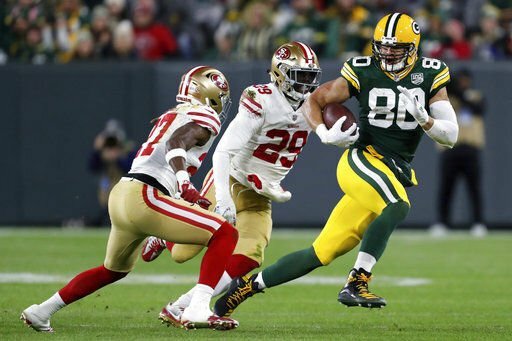 Graham, a five-time Pro Bowler, signed a three-year, $30 million contract with the Packers in the offseason following three years with the Seattle Seahawks. The Packers brought him in to provide a big target in the red zone for Aaron Rodgers. Through six games, Graham has 27 catches for 349 yards and a score, including 11 receptions on 20 targets over the past two games. With the Packers choppy so far in the red zone, Graham isn't perhaps having quite the touchdown production he initially envisioned. "Hopefully they'll start coming my way, too. It's kind of a rough start for us, just not finishing really and not getting the ball down in the end zone," Graham said after the 33-30 win on Monday night over the San Francisco 49ers. "We've got to work off that, with (Rodgers) and these receivers and these running backs and this O-line we've got, we've got a lot more than 30 points in us. And learn from this ... to get to where we're scoring every time we touch the ball. That's the goal. Start fast, finish fast." It's a goal to focus on for next week, though, when the Packers return from their bye to prepare for a game at the Los Angeles Rams. During this off week, Graham figures to be back in the air. He spoke about his love of flying over the summer during the EAA AirVenture show in Oshkosh, about 50 miles southwest of Green Bay. "I'll fly on off days. But basically once Wednesday starts, I'm doing nothing but watching film, getting the body ready and running people over," Graham said. He wasn't kidding — two days later, the Packers started training camp. Graham was drafted by the Saints in 2010 out of Miami. He played only one season of college football following four seasons as a power forward for the Hurricanes' basketball program. He followed in the footsteps of other NFL tight ends with basketball backgrounds such as Tony Gonzalez and Antonio Gates. One of the main reasons he got into football was because "a lot of people didn't believe I could do it," Graham recounted. "I took that whole idea of how difficult and impossible this thing was going to be and just took one day at a time and kind of used it as fuel," he said. His love of flying goes back to childhood after first seeing the Tom Cruise movie, "Top Gun." He wanted to be a Navy Seal or Marine, but he got bigger and taller, so he played basketball. It was during his junior year at Miami he had the opportunity to sit in a single-engine plane with a pilot certified in aerobatics. The experience got him hooked. "Flying was such a want and a dream that I had as a child, the first moment that I had to attack it, I did," Graham said. It was a challenge, too. "I feel like in my life, I'm always on the move, and I'm always looking for my next challenge, what can push me. And flying has really fulfilled that in many ways," he added. He wants to share that passion with a new generation of aviators after becoming the honorary co-chair of EAA Young Eagles Program, which is dedicated to giving youth ages 8 to 17 their first free ride in a plane. "He brings a completely different perspective to our Young Eagles program. He's a very accomplished individual, but did it really essentially himself," EAA Chairman Jack Pelton said. "As he tells the story, he took his first airplane ride and it hooked him on aviation," Pelton added. "So I think that's going to make him very relatable because that's where he came from." At Oshkosh, Graham gave rides to two young and aspiring pilots in his 1957 De Haviland DHC-2 Beaver. He started restoration on the classic in the summer of 2015. That November, Graham tore a patellar tendon in his knee, an injury that forced him to miss the final month of the season. The plane was finished in the summer of 2016. Graham returned for the 2016 season, and he has played every regular-season game since. "I think flying really focuses me, centers me," Graham said. "It gets me to disconnect from the pressures that this game can provide." The Green Bay Packers will open the 2018 regular season against the Chicago Bears on Sept. 9 at Lambeau Field. “I’d love to take the brace off after the bye, but we’ll see how I respond (Tuesday) and this week and next week,” Rodgers said. Packers focus on themselves in advance of trip to L.A.